Don't do them like that, Bronny! Typical second-generation NBA players struggle in matching the standard set by their predecessors (See Michael Jordan's sons, Patrick Ewing, Jr.). He may not come close his father's greatness, but LeBron James, Jr. has a chance to break the streak of second-rate basketball heirs and become a star in his own right. You know you did something sick when you get the three-time NBA champion and four-time MVP on his feet, and not just because he's your own dad. The older LeBron returned to social media recently—amid free agency buzz—by sharing a proud photo of his sons Bronny and Bryce. He didn't expect that his eldest has something in store to welcome him back with a bang. 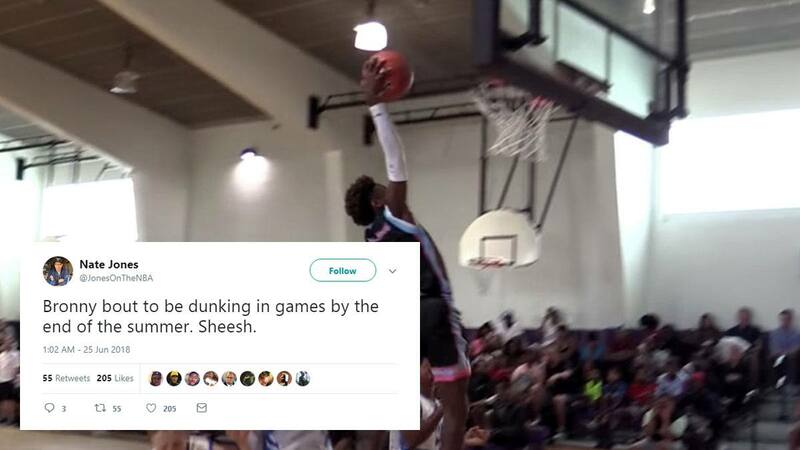 What made Junior's near-successful dunk attempt more incredible is his current state: the prized high school prospect is only 13 years old but stands at 5'10". We won't be suprised if he throws it down for real one of these days. Even though he failed, Bronny can now say he has one (achievement) on pops, which is breaking the internet at a younger age. What were you doing at 13? Bron and Bronny in 2023?